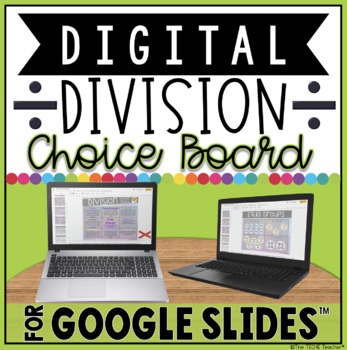 This digital choice board, or choice menu, for Google Drive™ contains engaging and paperless activities for students to use and practice basic division facts and different strategies. It makes a great way to differentiate for all learners! Students must have their own Google account in order to use this product. This will work on Chromebooks™, laptops and computers. It is NOT intended for iPads. IMPORTANT! This product does NOT! teach you HOW to use these tools. Students must be familiar with how to use Google Slides and Google Drawing. The web tools that are linked in are very intuitive for most students. ★ Arrays: Create the arrays for the provided division facts using the emojis on Slide 5. Then use the linked in Google Drawing template to create an array for a division fact that you find challenging. Save this as a jpeg or png image to insert into one of the accountability slides. ★ Repeated Subtraction: Show how repeated addition can help you solve the division problems (these can be edited) listed on Slide 8. ★ Dice Toll: Use Google’s Dice Roll tool (linked in) to roll the virtual dice two times. Type these two numbers as the divisor and dividend. Repeat 7 more times. Use Slide 4 as your recording slide. ★ Song/Rap: Write a song or rap about the division terms “dividend”, “divisor” and “quotient”. Record using Vocaroo. 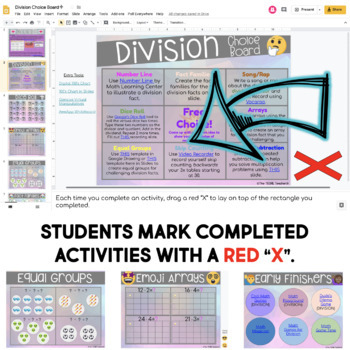 ★ Free Choice: Come up with your own idea to show your knowledge of division: I have linked in several digital tools on the side of this slide that students can use for this choice. 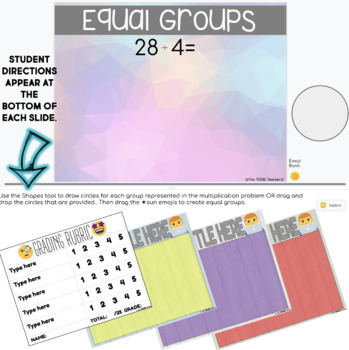 ★ Equal Groups: Use slides 9, 10, and 11 to create equal groups for the division facts listed. ★Skip Counting: Use Video Recorder to record yourself skip counting backwards your 3x tables starting at 30 (or whichever times table you would like for them to practice). 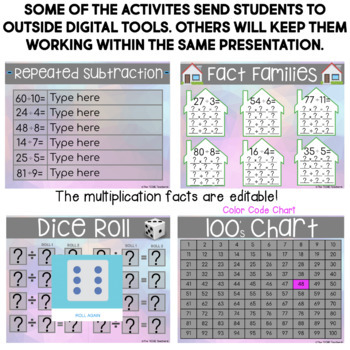 ★ Fact Families: Create the fact families for the six division facts on slide 6. All web tools are hyperlinked (including opening a new Google Drawing) so students can quickly and easily access the tool they need.